Elmex Child Toothpaste 2 x 50ml is specially formulated to preserve and protect your child's milk teeth from the very first one and up to the age of 6 years-old. Olafluor amino-fluorine quickly fixes on the enamel to form a protective layer; it makes teeth more resistant to mineral losses related to decays, and stimulates the remineralisation of enamel. 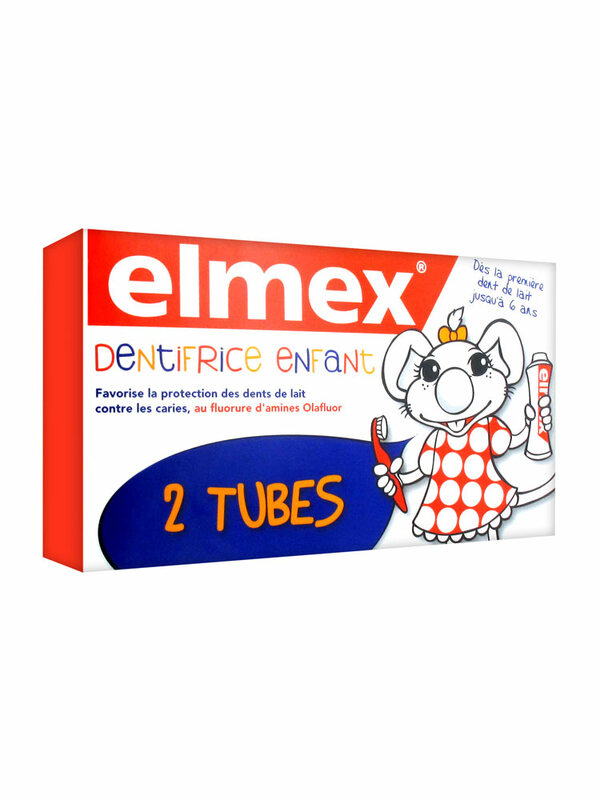 With a adapted rate of fluorine for children and milk teeth, Elmex Child Toothpaste is recommended for the greatest protection and care of milk teeth. Brush your child's teeth once a day up to 3 years-ols. Then from 3 to 6 years-old, brush or help your child to brush teeth from two to three times a day. Indication: Dental hygiene, prevention of the decays, milk teeth. Children up to 6 years-old. Active Ingredients: Fluorure d'amines Olafluor (500 ppm). My daughter love it. Without flavour. Очень люблю его! Даю моим детям. прекрасно!